Expert Swiss - SPA skincare. Indulge & replenish. Relax with nourishing, softening essential plant oils. Dermatologically tested. Gentle on the skin. Neutral pH.Indulge your senses with expert spa skincare from Fenjal Originally developed in Switzerland by leading skincare experts, the luxurious Fenjal spa skincare range is specially formulated for the ultimate in skin protection and pampering. 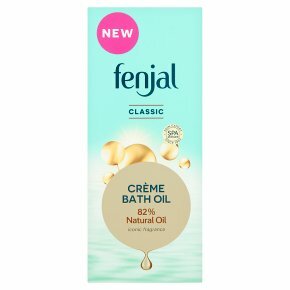 A unique bathing experience The pure plant oil in Fenjal Crème Bath completely disperses in water to form a fine blend of natural, caring elements to nourish your skin with the valuable oils that everyday life steals away. Your skin feels soft, silky smooth and perfectly cared for. Caution:<br>Clean bath after use as product residue can leave a slippery surface.<br>Avoid placing on the edge of your bath.<br>Avoid contact with eyes.